Thrigmopoeus truculentus Pocock, 1899 is a very beautiful burrowing species from the Western Ghats, India. In contrast with the highly anticipated and vibrant Thrigmopoeus psychedelicus, Thrigmopoeus truculentus is stunning light brown. The species is often confused with the darker blackish and bigger Thrigmopoeus insignis. There are quite some doubts whether or not these species are the same in the hobby, both Thrigmopoeus truculentus, but labeled differently. In Uttara Kannada and Goa the species was commonly encountered sharing her habitat with Chilobrachys fimbriatus. The genus is taxonomically and in locality closely related to Haploclastus. The species is commonly found in some areas, but rather rare in its distribution area. She’s listed as “near threatend” on the IUCN Red List of Endangered Species. Common name: Lesser Goa Mustard Tarantula. Karwar Large Burrowing Spider. Note that Thrigmopoeus truculentus hasn’t been recorded in Karwar since its first description in 1899. Previous names: Thrigmopoeus truculentus Pocock, 1899, Thrigmopoeus minor Strand, 1907. Type: Thrigmopoeus truculentus is a burrowing species. Venom: No valuable scientific research has been done yet. Origin: Thrigmopoeus truculentus is endemic to the norhtern Western Ghats of Karnataka, Goa and southern Maharashtra, from Amboli in the north to Madikeri in the south. The species was found at an altitudinal range of 200 to 1000m. Thrigmopoeus truculentus hasn’t been recorded in Karwar since its first description in 1899. Click here to see a beautiful map display of the spider’s distribution. IUCN Red List: The species is commonly found in some areas, but rather rare in its distribution area. What you need to know about CITES. Body length: ≤ 6-7cm. Some sources mention 8cm. Span width: ≤ 12-16cm. Some sources mention 20cm. Life expectancy: No valuable source found. Behavior: Thrigmopoeus truculentus can be skittish and defensive, but will most certainly try to flee at first. Persistent provocation may result in threat posture, stridulation and/or a bite. The spider will burrow herself a way down. Thrigmopoeus truculentus can be considered to be a pet hole. Sexual dimorphism: Yes. Females are bigger. Adult males are slender and have remarkably longer legs. Thrigmopoeus truculentus inhabits moist deciduous and evergreen forests with intensive monsoon period. Warm air temperatures are not rare for the region. The spider, however, was mainly found in road side mud bunds at the base of trees at 0,5-5m height from the ground. Their burrows are located as such to attract minimum sunlight and are usually covered with grass and ferns during monsoon and post monsoon. Don’t overheat your terrarium. Juvenile and subadult species were often found in individual burrows close to the adult female’s burrow. Observations on population indicate a very high mortality rate of 95% from juveniles and subadults. Mainly in areas with very little disturbance healthy populations were found. In Uttara Kannada and Goa the species was commonly encountered sharing her habitat with Chilobrachys fimbriatus. Temperature: 24-30°C (day), 22-24°C (night). * A microclimate with minimum direct sunlight, high humidity (70-80%) and temperatures between 22-30°C are ideal for local burrowing species. Due to good habitat conditions Silwal & Molur found 323 burrows of different theraphosid species over 200m. * Rainfall is remarkably higher for 3-4 consecutive months. Adult: LxWxH: 20x20x30. 2x span width in height. Smaller than adult: 2x span width in height. * Keep the substrate slightly moist. * Note that cages with high humidity levels are very sensitive for mites and other parasites. Please take your precautions. Wet season: June, July, August. Dry season: November, December, January, February, March, April. Warmest months: February, March, April (precipitation is low). * IMPORTANT: Note that the Thrigmopoeus truculentus inhabits area with humidity around 70-80% and avarage temperatures between 22-30°C. During monsoon (June, July, August) and post monsoon the spiders’ burrows are covered. Keep environmental conditions fairly constant. Thrigmopoeus truculentus is endemic to the norhtern Western Ghats of Karnataka, Goa and southern Maharashtra, from Amboli in the north to Madikeri in the south. The species was found at an altitudinal range of 200 to 1000m. Thrigmopoeus truculentus hasn’t been recorded in Karwar since its first description in 1899. 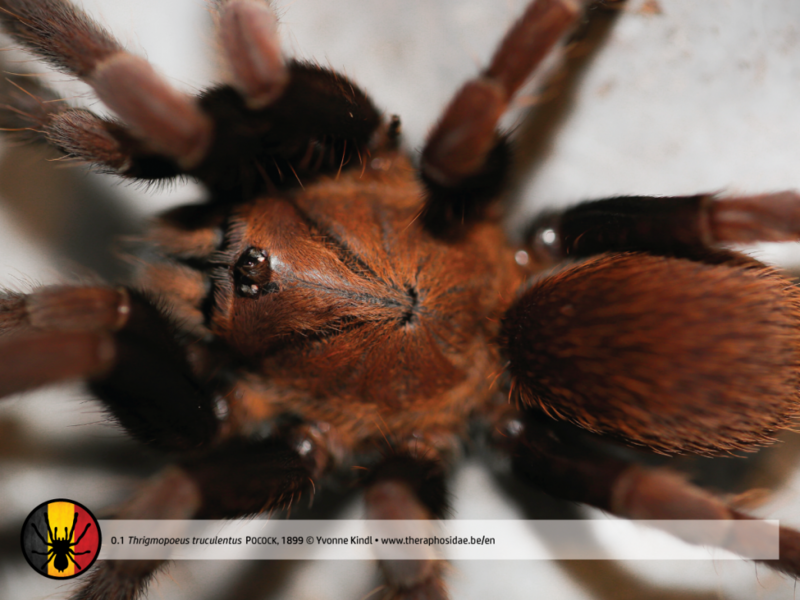 Click here to see the map of Thrigmopoeus truculentus. Click here to see the map of Thrigmopoeus insignis. Click here to type locality of Thrigmopoeus psychedelicus (southern Kerala State, India). Breeding Thrigmopoeus truculentus is normally not that difficult. A decent terrarium with enough space to create a hammock shaped cocoon (picture) is necessary. • Introduce the male by 25°C and keep it steady the whole time. • You might like to create a little “rainy season” (not “drainy”) about 10 weeks directly after mating. • About 3 months after mating the female will start making the hammock shaped cocoon (picture). Deprive the cocoon, when desired, 5 weeks later. About 6 weeks after encountering the first nymphs the spiderlings will hatch. Expect around 100-300 spiderlings. As mentioned in the article below by Hans Cools, it might take even up to 6 months before the female starts making the cocoon. • You may consider to wait until the mother opens the cocoon. • Note: If you’re planning a mating with a female around the same size of the adult male, make sure you remove him from the enclosure immediately after copulation. 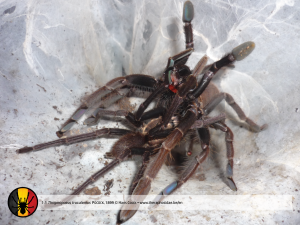 As mentioned in “Tarantulas, Breeding Experience & Wildlife”, by Cléton, Sigwalt & Verdez, mature males of the same size as younger females have been seen consuming the mated female. • It is estimated that spiderlings of burrowing species undergo 2 moults within the mother’s burrow before moving out? • Thrigmopoeus truculentus is often found at the base of trees on road side mud bunds, even up to 5m high? • Mortality rates in its natural habitat is very high in the wild? • Thrigmopoeus truculentus is near threatened in its local habitat? Read more. • Juvenile and subadult species were often found in individual burrows close to the adult female’s burrow? • Thrigmopoeus truculentus is commonly found in certain areas, but rather rare in its distribution range? • Redescription, distribution and status of the Karwar Large Burrowing Spider T. truculentus Pocock, 1899 (Araneae: Theraphosidae), a Western Ghats endemic ground mygalomorph (2009). • Verdez, J.-M. & Cléton, F. (2003): T. truculentus, Pocock 1899 DeArGe Mitteilungen 8(4): 20-26. Special thanks goes out to Hans Cools from the Belgian Tarantula Breeding Team for sharing his article about Thrigmopoeus truculentus on this page below. 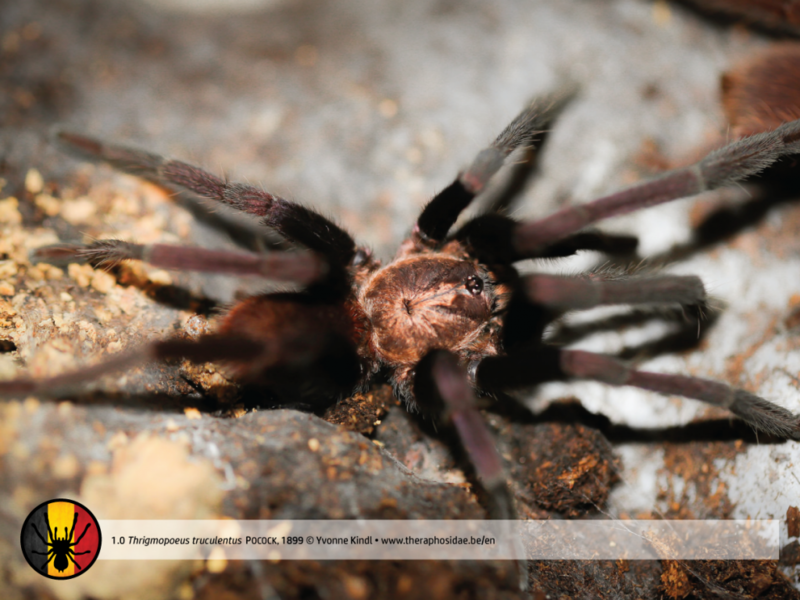 – As published in the Journal of British Tarantula Society 2014, volume 29, nr. 3. In that time, the scientific paper about Thrighmopoeus psychedelicus Sanap & Mirza, 2014 wasn’t published yet. I came in touch with Thrigmopoeus truculentus some years ago, when a fellow hobbyist had bred them for the first time in the Benelux. He gave me two large spiderlings early in the year 2010. His breeding dated back to June 2009. He was able to breed the species again in 2011, and gave me some spiderlings once more. Out of the three spiderlings I got the second time, only one survived. It is now (mid 2014) a juvenile/subadult male. My two original spiderlings both survived and turned out to be two beautiful adult females. Thrigmopoeus truculentus is not easy to find in the hobby. Seldom bred, males are subsequently scarce. The genus Thrigmopoeus was described in 1899 by Pocock. He described two species: T. insignis and T. truculentus, both indigenous to India. Together with the genus Haploclastus, Thrigmopoeus belongs to a Theraphosidae subfamily called Thrigmopoeinae. These spiders are burrowers, but differ in the way they build their egg sac. While members from other Asian subfamilies, such as Selenocosmiinae and Ornithoctoninae, carry their egg sacs; Thrigmopoeus spp. and Haploclastus spp. build an egg sac fixated to a horizontal structure. In the hobby, this is often referred to as a ‘hammock’ and can also be observed by African species of the Harpactiriniae subfamily. The need for a horizontal structure is important to remember when setting up an enclosure for these animals. More on that later. According to the IUCN Red List of Threatened Species, Thrigmopoeus truculentus is endemic to the Western Ghats of Karnataka and Maharashtra. The species is found in Amboli in the north and Madikeri in the south, at an altitude range of 200 to 1000m. As stated earlier, I have two adult females of this species. I both keep them in a standard 5,8 liter plastic container (185x185x190mm). I filled about three quarters of the enclosures with peat. On top of that, I put a piece of cork bark, placed horizontally. I found that there was no need to pre-dig an entrance under the cork bark. The females soon started digging under the bark, removing soil from under the bark an placing it on top. After a few weeks, the pieces of cork were not visible anymore. Both females had made a double entrance under the bark, heavily reinforced with web. I kept the soil moist by flooding the enclosures every couple of weeks, making sure the water did not flood their actual burrow. The room in which the enclosures were kept, had a temperature between 23° C and 28° C, depending on the season, with small temperature drops at night.  Together with some other friends in the Belgian Tarantula Breeding Team, we had four adult females in the course of the year 2013. We had been looking out for an adult male for some months when we finally found one for sale in Hamm. I was able to get the male in November 2013. At this point, he had already mated with (at least) one other female, and was not looking too good. To be honest, I thought he would die any day. There was hardly any movement at all, even when pushed or poked. I had already given up hope that he could inseminate one, let alone two females. Still, if he was going to die, I could just as easy try and introduce him with the first female. What I saw then was incredible. This old male spider that I had believed to be almost dead, suddenly came to life. Reacting on the initial vibrations of the female, which were pretty heavy to say the least, he immediately took a steady posture and started drumming towards the female. Within minutes, I had seen a mating with several succesful penetrations. Interesting to note: I could ‘hear’ the penetrations, as if his bulbi ‘clicked’ into the female’s epigastric plate. The mating ended without any sign of agression, and I was able to remove the male from the female’s enclosure. Quite interesting to note: It was the second female that had obviously built the first sac; at the time she had spiderlings running around in her burrow, the offspring of the first female had only reached the second nymph stadium. They moulted to spiderling three weeks after I had removed them from the enclosure of their mother. Even though they are not bred that often, I found few difficulties leading this project to a (double) success. Perhaps these two breedings will result in this species being more available in the hobby the coming years. Kind regards go out to Tom Lehouck for the animals, the breeding information and advice, Geert Geuns for the adult male, and Matthijs Tempelman, Eddy Hijmensen and Jean-Michel Verdez for their help and advice in writing this article. • Platnick, N.I. 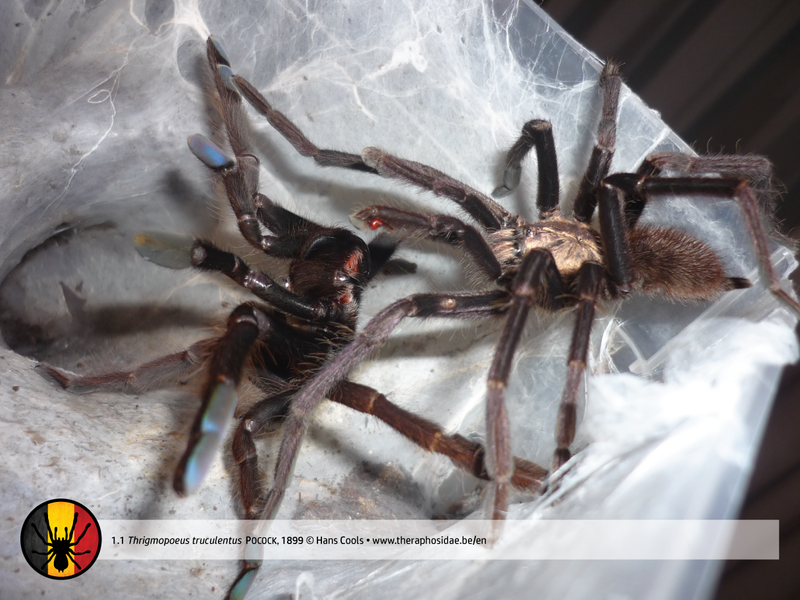 (2014): The world spider catalog, version 15. American Museum of Natural History. Web. July 2014. • ‘T. 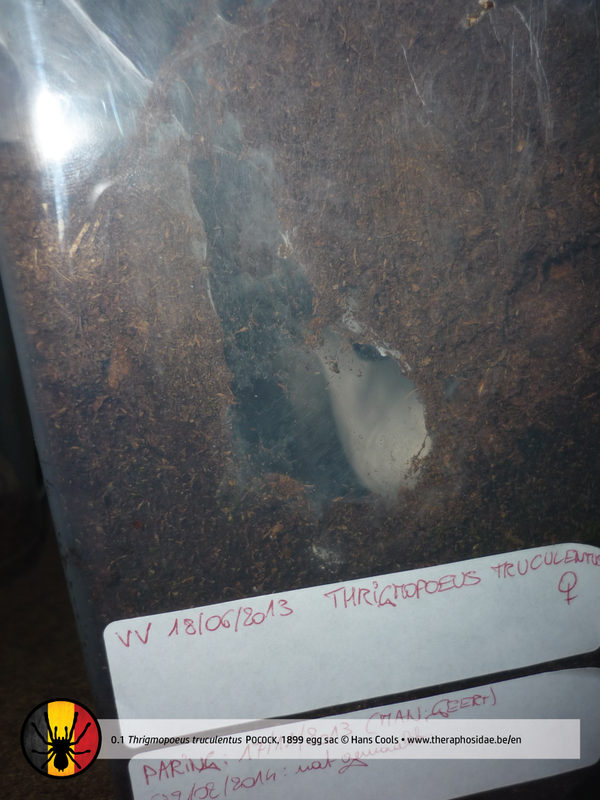 truculentus (Karwar Large Burrowing Spider)’. The IUCN Red List of Threatened Species (2014.2). IUCN, Gland, Switzerland and Cambridge, UK. Web. July 2014.